Get ready to shop for our hottest phones. The only thing that's changed is everything. A 4.7-inch Retina HD display with 3D Touch. 7000 series aluminum and stronger cover glass. An A9 chip with 64-bit desktop-class architecture. All new 12MP iSight camera with Live Photos. Touch ID. Faster LTE and Wi-Fi¹ Long battery life² And iOS 9 and iCloud. All in a smooth, continuous unibody design. In the next step, you will have the option to bundle your Phone with one of our no-contract plans. A service Plan card is required for activation. Plans are not returnable or refundable. Data plan required. LTE Advanced and LTE are available in select markets and through select carriers. Speeds are based on theoretical through-put and vary based on site conditions and carrier. For details on LTE support, contact your carrier and see www.apple.com/iphone/LTE. Go to for a complete set. At 60 GB, we reserve the right to review your account for usage in violation of Straight Talk's terms and conditions. SPECIAL OFFERS: Save $1.00 when you enroll in Auto-Refill. A9 chip with 64-bit architecture. Embedded M9 motion coprocessor. The world's most popular camera is more advanced than ever. The 12-megapixel iSight camera captures sharp, detailed photos. iPhone 6s also takes selfies worthy of a self-portrait with the new 5-megapixel FaceTime HD camera. And it introduces Live Photos, a new way to relive your favorite memories. 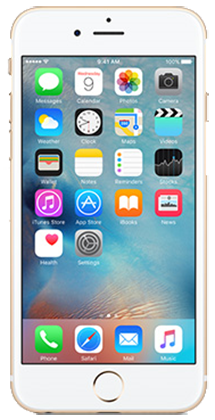 iPhone 6s features LTE Advanced with speeds up to twice as fast as the previous generation. It supports more LTE bands than any other smartphone. Built-in apps are an essential part of your iPhone experience and are efficiently designed to use less than 150MB of storage. The world's most advanced mobile operating system gets major enhancements to built-in apps, a smarter Siri and search, and much more. iPhone 6s and iPhone 6s Plus are not compatible with existing micro-SIM cards. PROCESSOR A9 chip with integrated M9 motion coprocessor. 25GB First 25GB of Data at High Speed then 2G*. Ultimate Unlimited Video typically streams at DVD quality. Upon purchasing this plan, you will receive a physical card with 2 PINs printed on it. Each PIN on this card must be added to two separate phones. The second PIN must be redeemed within 7 days from when the first PIN was added or the second PIN will become void. 25GB First 25GB of Data up to 4G LTE Speed then 2G*. I don't need a Service Plan. *At 2G speeds, the functionality of some data applications, such as streaming audio or video may be affected. Please refer always to the latest Terms and Conditions of Service at StraightTalk.com. **Each account is allowed to dial up to 15 unique international telephone numbers during a 30-day plan cycle, which resets each time a new plan is redeemed. Unlimited international calls are available to landline and mobile numbers in select destinations only, which are subject to change at any time. Calls must originate from the US or Puerto Rico. No international roaming allowed. Other terms and conditions apply. For personal use only. Please refer always to the latest Terms and Conditions of Service at StraightTalk.com. Signature is required for USPS & FedEx delivery method. If you are not satisfied with your phone and/or accessory purchase, simply return it to us within 30 days and we will replace it or give you your money back. It's that simple. Straight Talk Service Cards, and /or unused minutes are non-refundable. It takes up to 30 business days to process the return and credit your account. Credit for returned phones and/or accessories will appear on your credit card statement between 1-2 billing cycles. No Credit Check” means that a FICO score will not be used to determine eligibility, but payment history on phone service plans and other bills, credit information, and consumer reports may still be reviewed and considered. Approval not guaranteed. This is a lease-to-own transaction. Not available in MN, NJ, WI, and WY. Customer will not own the device until all payments are made, but may be able to exercise an early purchase option. The customer may end the lease and return the phone at anytime. Lease-to-own requires a Straight Talk 30-Day Unlimited plan and is additional. Wireless service is subject to Straight Talk Terms and Conditions, visit StraightTalk.com. SmartPay is an independent company that is leasing you the phone. Straight Talk is not a party to any transaction you make with Smartpay. Service Plan cards are not refundable. If the Service Card is purchased as part of a Straight Talk phone bundle, the phone purchase can be returned/refunded however the Service Card is not refundable. I acknowledge that once the order is placed it cannot be canceled. You may refuse the package upon delivery or return it following the instructions on the shipping label. All new Straight Talk phones (except iPhones) are covered by a one (1) year limited warranty administered by Straight Talk as set forth below. All reconditioned or refurbished phones sold by Straight Talk (except iPhones) have a ninety (90) day limited warranty as do all wireless accessories sold by Straight Talk. New Apple iPhones are covered by a one-year limited warranty offered and administered by Apple. Please visit apple.com for more information. To the extent available for purchase, refurbished iPhones and certified pre-owned phones are not covered by a limited warranty but may be returned for a refund within 30 days of purchase. Complete terms of Straight Talk’s Limited Warranty are available for review in the Terms and Conditions of Service. STRAIGHT TALK will repair or replace your phone and/or accessory that contains a manufacturer's defect that hinders or prevents its proper operation for up to one year (90 days on all accessories) from date of purchase (proof of purchase required). All offers are subject to change or discontinuance by STRAIGHT TALK Wireless, Inc. at any time without further notice. Straight Talk Wireless, Inc. reserves the right to limit quantities and to reject or cancel orders in its sole discretion. Product is not for resale or distribution. Android, Google Play and other marks are trademarks of Google Inc. The Android robot is reproduced or modified from work created and shared by Google and used according to terms described in the Creative Commons 3.0 Attribution License. All other trademarks, service marks, and trade names referenced herein are the property of their respective owners.